It ha almost been a year since my first meal at Sugalabo. I was as excited as last time, although the meal was not that life-changing as i expected, it was indeed unique and stands out in its own way. It was such a prestige to come back here again - one of the restaurants that are hardest to get a reservation in Japan. Members only, the contacts are not open to public, and even the entrance was mysterious. 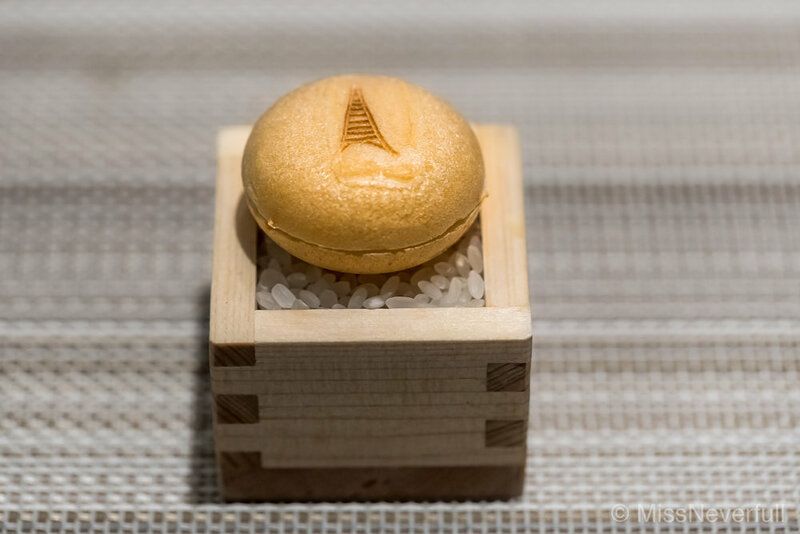 The chef-owner Yusuke Suga san has been worked with Robuchon for 16 years. His strong base and talents alongside his distinctive understanding of cooking bring up his success. Sugalabo is currently rank No.4 in Tokyo and No.5 in Japan among all the western restaurants on Tabelog. Sugalabo is possibly the best designed restaurant i have been in Japan. The reception is set inside a small cafe and the entrance was behind a shelf of postcards. Behind the door - a space of heartwarming orange tone, with clear lines of silver pipelines in the kitchen and on the walls. The restaurant includes one semi-private room, a big table in the main dining room and a eight-seat counter. The meal started with four amuse bouche. Monaka (Japanese wafer) is a fixed bite at Sugalabo to awaken the taste buds. The filling inside the wafer changed seasonally. This time it was stuffed with egg and karasumi (dried mullet roe). 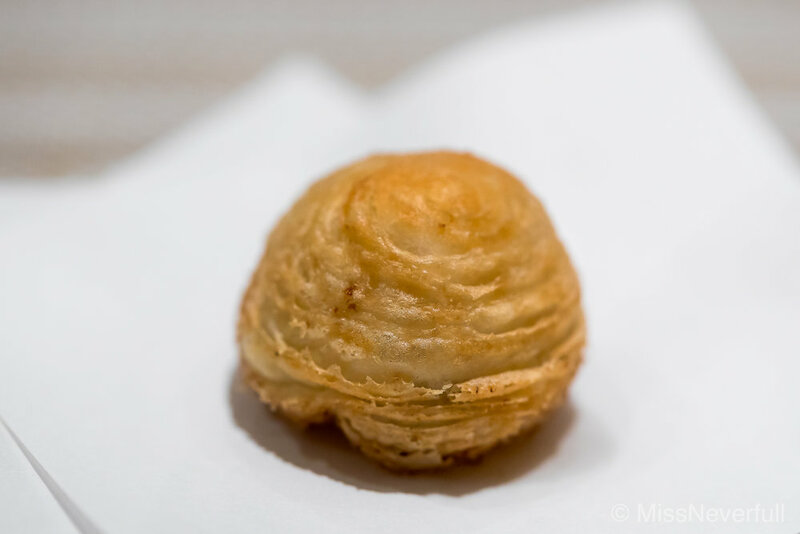 Followed by a baked baby onion choux, it has a really creamy center which was naturally sweet. Another two bites of deep-fried Fukinoto (butterbur) and a seasonal asparagus quiche also appetizing. One of my favorite dishes of the meal was the PÄRSÙT ham over steamed rice. The ham was from the famous provider Bon Dabon in Gifu prefecture, which is only certificated ham producer in Japan. The incredibly aromatic and rich ham balanced so well with the steamed rice. A dish i would always happy to have at Sugalabo. The first dish of the meal finally arrived after a solid beginning. 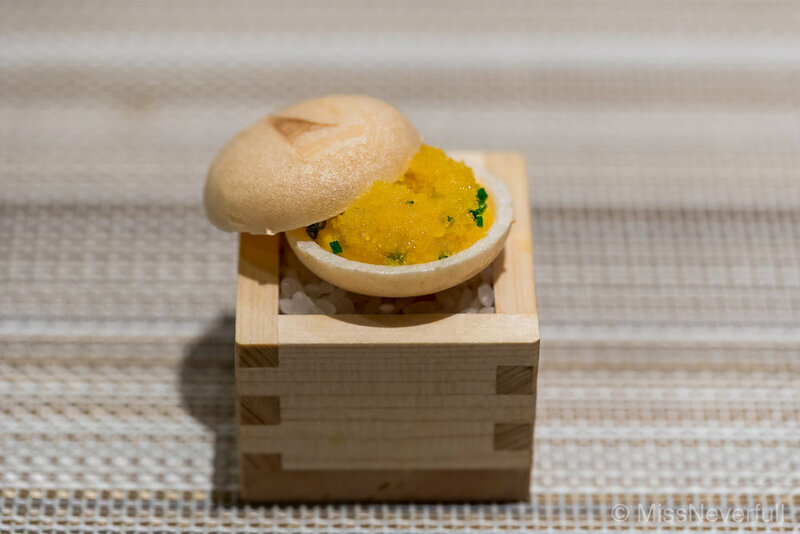 Hokkiado uni, snow crab with dashi jelly tastes exactly as good as it sounds. The ingredients were no doubt top-notched, i cannot be happy anymore when the sweet hint comes all along with the umami bursts. It was a dish packed with wonderful balance of flavors and textures - juicy, creamy, and the a touch of refreshing of the jelly. Another my favorite dish of the meal. Japan is my favorite place to eat abalone. This dish consists of abalone from Ezo in Hokkaido, potatoes from Imagane Prefacture, and sun-dried tomato, and a creamy delicious sauce of abalone liver. Chef Suga-san is very English-friendly and talktive. He frequently asked us how was the food, also telling us stories about how did he source ingredients from different prefectures in Japan. Each season, Suga-san travels outside Tokyo serval times to hand-pick ingredients for his restaurants. The fish course was also a beautiful combination of the land and ocean. The monkfish was perfectly seared, topped with sweet cabbage from Hokkaido and shiitake king mushroom from Tottori. Besides the buttery sauce of the fish stock, the spice gives the dish a mildly hot kiss. Suga-san is a genius in cooking, especially combining ingredients and roasting/grilling meat. Besides the famous roasted beef which my partners had, i got a chance to try the roasted Ehime pork. Its light pink color tells how succulent it is. Although the plating looks like a fine dining version of B class delicacies (steak with sunny side up, side by gratin), but the taste was no doubt world-class. My partners and i coincided that the gratin with black truffle was the highlight of this dish, it was marvellous! Sugalabo is a very interesting 'Innovative French' restaurant which serves curry rice upon request, to me it is a way that Suga-san respects his root, his homeland. The curry was freshly cooked with minced beef inside, the portion of rice and curry was to point. I also liked the pairing of spice and pickled onions on the side. The meal continued with a dessert of citrus from Ehime and basil ice cream. Underneath the basil ice cream and a fruity soup base of assorted citrus, really refreshing to cleanse the palates. Next was a strawberry sweets made of the premium strawberries 'Kotoka' from Nara. It comes with vanilla ice cream, meringue chips, fresh cream and crushed pistachios. The textures and sweetness was impeccable. The last part of the meal was coffee and two coffee sweets, madeleine and coffee egg pudding, which are two fixed bites to end the meal. Chef Suga-san uses the best Tosajiro egg to make these two desserts, thus the tastes was quite 'eggy' and impressive. Suga-san's madeleines are one of my favorite i have ever had. Before i left the restaurant, Suga-san gave me a gift of chocolate pound cake - a limited version! This was my second visit at Sugalabo, and i liked it a lot more than my first visit when i has just opened for few months. Different from other Japanese-French restaurants and traditional French restaurants in Japan, Sugalabo is possibly the most unique French restaurant i have been to - it stands out in its own way. I cannot wait to come back again!